Updates to Maryanne's profile since your last visit are highlighted in yellow. I moved to Canada in 1971 and decided I liked it there. Finished university and grad school, married Diaa el Gabbani in 1980. 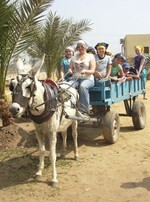 Moved to Egypt with kids and husband in 1988 to manage businesses here. Husband died in 2000, but I stayed to settle estate issues and businesses. Retired to a farm outside of Giza where I live with a large number of animals and winter visitors. Kids are currently living/working/studying in NYC. Mike Terry posted a message on Maryanne Stroud's Profile. Maryanne Stroud Gabbani has a birthday today. We do a fair bit of work with schools and scouting. A wagon ride is a real treat for the kids. Most kids in Cairo live in apartments. High school students learning about cleaning horses. George, our master donkey, is pretty willing to let visitors drive. I raise goats as well. I've bought some good imported goats to boost the local quality for the farmers. But mostly the babies are just dead cute and love being cuddled. 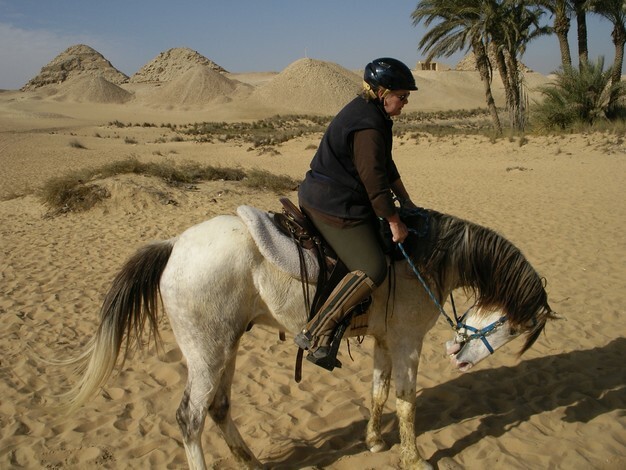 When we have tourists in Egypt, we offer riding trips in the desert and countryside. These are our neighbourhood pyramids, the pyramids of Abu Sir, and the desert that is just across the road from me. You never know who you are going to run into on a country trail in Egypt. These camels are going out to the fields to carry back cut palm fronds to the village where they will use them to make furniture and boxes, ropes and baskets. I often assist photographers, in this case a US based guy who films and shoots bodybuilders in Egypt. They sometimes use horses, but this time it was camels. Our countryside is incredibly green and crisscrossed with canals. In the distance you see the pyramids of Abu Sir. My kids in New York. From left: Vanessa, my daughter in law, Yasmine, my daughter, and Nadim, my son in his pocket garden, a real prize in Manhattan.